Compuflex Corporation’s Intermediary solutions act as a bridge between the cash management application and the cash automation device. Our proprietary screen management utility is used to “softly” integrate the cash management application (e.g. teller application) with our Intermediary solution. For multi-workstation environments, the soft integration mapping occurs only once. The configuration settings are ported over to all applicable workstations. No coding is required. The technical professional installs and configures. The device is ready for use. When a user initiates a transaction using the cash management application, our solution makes the corresponding communication to the cash automation device. 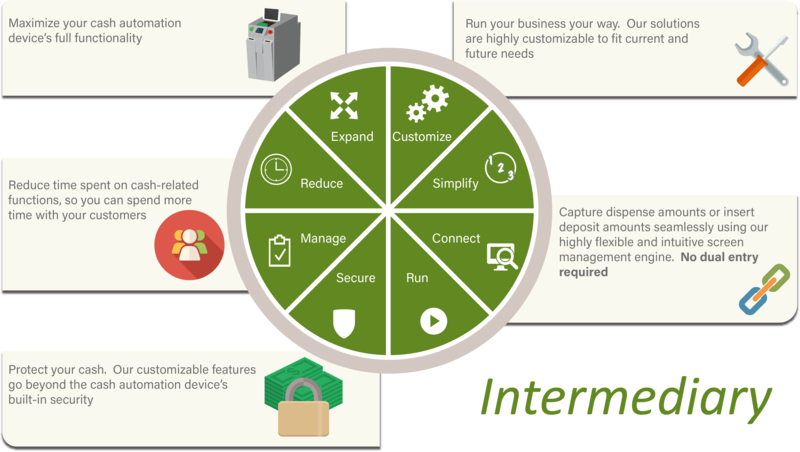 Compuflex’s Intermediary solution is the liaison, communicating instructions to the device. For example, if the user initiates a withdrawal transaction, the Intermediary solution communicates with the device.